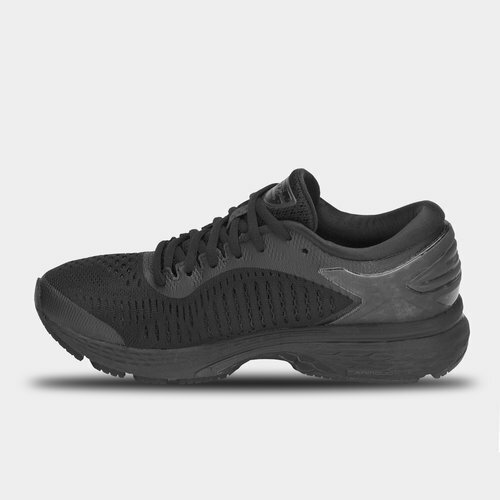 Go the distance in these Asics Gel Kayano 25 Ladies Running Shoes in Black. These running shoes from Asics are guaranteed to have you standing out. These trainers have been crafted and perfected over 20 years coming packed with the revolutionary lightweight FlyteFoam Propel cushioning. The use of this cushioning and Lyte technology ensures extra bounce and durability. Designed to provide the highest level of stability with the new upper also offering an enhanced fit. The mega-clutch provides better heel-holding whilst the medial support offers extra protection. The runner will benefit from comfort from the first step to the last thanks to the Ortholite X-40 sockliner, rear and forefoot GEL and spacious toebox.